What Is Apple's WWDC Mystery Sign? 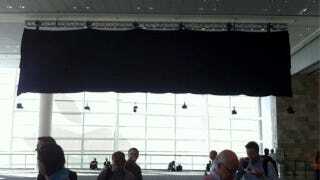 Reuters' Alexei Oreskovic just spotted this blacked out mystery sign hanging high at the Moscone Center, where Apple is about to reveal a whole bunch of expensive things to buy. What one will this be? We don't know! Soon. Soon.